A friend of mine from Berry, David Power (of the Permaculture Power blog), is running a couple of 2-day “Introduction to Permaculture Design” courses in September and November. He’s trained under all the big names of permaculture! For more information, visit David’s main site, Permaculture Power. 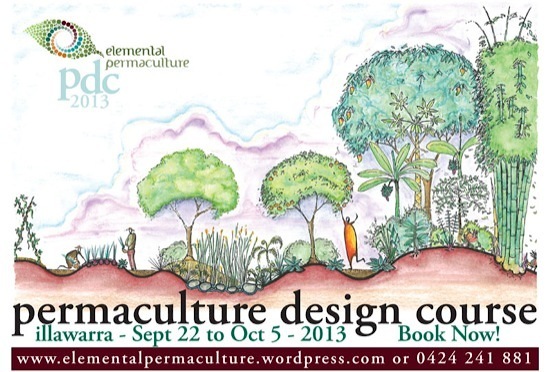 Or if you’re interested in doing a full 72-hour Permaculture Design Certificate (PDC), there’s one coming up in late September in Wollongong (specifically, at Warrawong High School). This is the first face-to-face PDC I’ve heard of in the Illawarra, so if you live here and you’re unsure – grab the opportunity now while you can! I’ve met Dan and Aaron, the guys who will be running this course, and they’re excellent communicators. They are the team behind a number of Illawarra school permaculture gardens, including the Kiama Primary School garden that I’ve written about before. Dan did his own PDC with April at Permaculture Visions, where I’m currently doing mine. For more information, visit Elemental Permaculture. It’s great to see some high-quality local courses being offered, and I’d like to think it reflects a growing interest in permaculture in our area. Great stuff!